"A richly inventive novel about a centuries-old vampire, a spellbound witch, and the mysterious manuscript that draws them together. 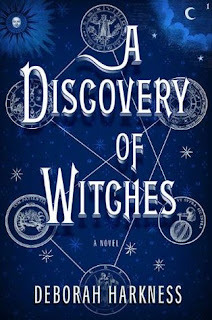 Debut novelist Deborah Harkness has crafted a mesmerizing and addictive read, equal parts history and magic, romance and suspense. Diana is a bold heroine who meets her equal in vampire geneticist Matthew Clairmont, and gradually warms up to him as their alliance deepens into an intimacy that violates age-old taboos. This smart, sophisticated story harks back to the novels of Anne Rice, but it is as contemporary and sensual as the Twilight series-with an extra serving of historical realism." A Discovery of Witches was by far the best book I have read in a long time. While yes, the size of the book itself is slightly intimidating, it was a pretty fast read that keeps your attention. I did not want to put this book down, because things just seemed to keep happening. You begin to really connect with each character and become engrossed in their world and stories. I will happily buy the second book and eagerly await its arrival. Diana is a sweet main character that is pulling manuscripts for research. She unknowingly receives one that is spelled and manages to unlock the spell without really trying. No one has been able to call the manuscript out of hiding for hundreds of years. This makes her quite popular with non-humans, since they all want it for some reason and will stop at almost nothing to get it in their hands. Matthew, a vampire is quite an interesting character that has you hoping they will get together. I believe this series could be the equivalent of the Twilight series, but for adults. Though it is better written, has a more interesting story line, and characters. If you begin to read it and are not too interested give it about 1/4th of the way through the book, that is about when I fell in love with it.